Buy 4 patterns - Get 1 FREE! - No coupon code needed! Simply add 5 patterns to your cart and only pay for 4. 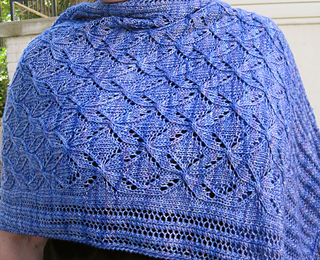 Although this pattern is somewhat similar to my other shawl that includes the words “snowflake” in the title, this one has a cable in it, creating a very different look. 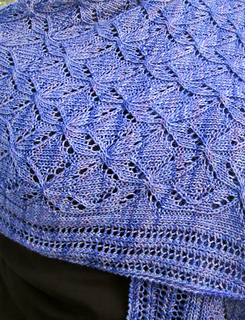 It will also appeal to all of you “cable knitters”, and makes for a slightly warmer shawl. 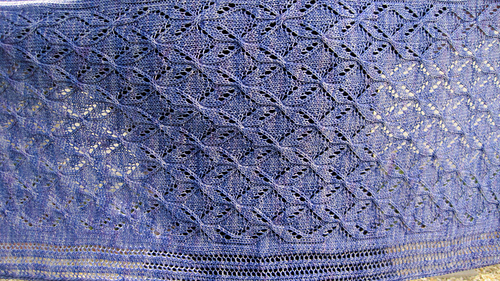 The stitches are both written out and charted within the pattern. This pattern was expertly tested by Mimi Sevimli who can be contacted at, karal3@yahoo.com. It was made using Fleece Artist’s Merino 2/6, in colorway, Periwinkel.